I recently discovered that a friend from high school, Rachel Najarian, creates and sells colorfully beaded jewelry locally in Toledo. I jumped at the chance to borrow some of her pieces to be the inspiration for some outfits and to support a local artist! I discovered Petite Studs, a local online shop that sells handmade stud earrings, earlier this year and became smitten with their fun and funky designs. Made of high end clay and resin, the earrings are allergy free and very reasonably priced – about $10 a pair. 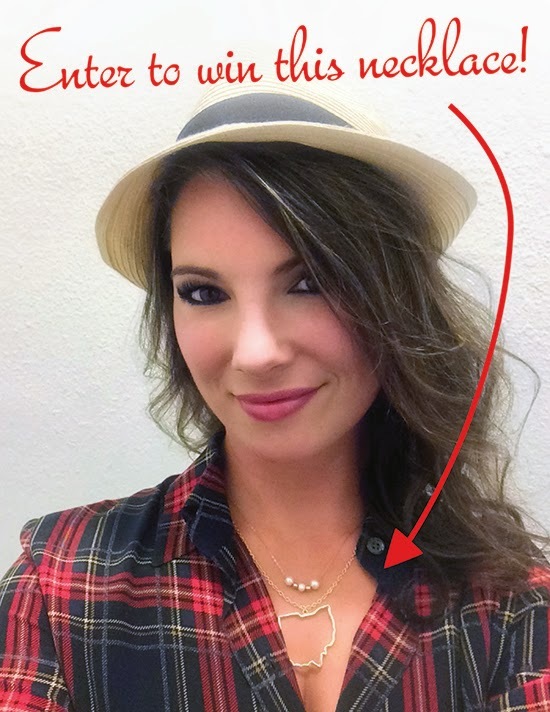 Ohio Lovers & Buckeye Fans, Win This Necklace! I’m happy to call Ohio “home” and I enjoy discovering more of what the “heart of it all” has to offer. So far this summer, I have enjoyed riding roller coasters at Cedar Point, dining at The Greene in Cincinnati, visiting the Toledo Zoo, taking a boat ride on the Maumee River and there’s still so much I’d like to do! From partying in Put-in-Bay and catching a baseball game in Cleveland to camping in Hocking Hills, plus so many concerts, shows, festivals, shopping... Ohio has so much to discover!